McLeod Ganj, also referred to as little Lhasa, draws a lot of tourists each year. Being the residence of His Holiness Dalai Lama, the place is extremely famous all across the globe. The town is home to maonasteries and Buddha Statues. If you visit Dharamshala, then you must visit the popular Jwalamukhi Temple. This is dedicated to the Goddess of Light. People visit this temple to have a glimpse of a constantly burning blue flame, emanating from inside the rocks. This flame is considered sacred and worshipped. Some of the other attractions of the place include Kalachakra Temple, Machhrial and Tatwani, Kunal Pathri, Kangra Art Museum, Dharamkot, Triund, Namgyal Monastery, Kareri, Aganjar Mahadev Temple, Guna Devi, Naddi, Gopalpur, and Kangra Chamunda Devi Temple. 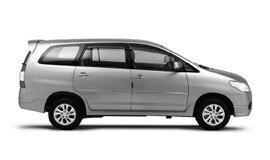 Booking a taxi will help you enjoy the tour better in Dharamshala and to and fro the international airport. Planning to visit Dharamshala? We at My Taxi India believe in making a contribution to help our customers etch a lasting memory of the trip in their hearts. Our team of professionals consistently endeavour towards ensuring the best tour related services to esteemed patrons and help them enjoy throughout. The management strive towards raising the service standards for our esteemed clients and potential customers. Our experienced fleet engineers are committed to ensure 100% convenience and safety. The team of trained chauffeurs will drive you through the state and the best places to visit. We make double sure that you experience minimum in terms of vehicles not being functional. If you are looking forward to hire a cab to reach Dharamshala railway station, airport or other destinations, we stand ready, with a smart fleet for you 24 x 7. All you need to do is reach us at our online portal or call at one of our booking service numbers and book a taxi to ensure expedient, 100% secure, easily accessible, and lucrative travel experience. We never will under any circumstances, compromise in quality. With us, you can rest assured about adept airport taxi service at the airport for travel to nearby destinations or anywhere within or outside the country. For an unforgettable tour experience, get in touch with our friendly and professional customer service representatives any time to solve queries related to journey to and fro airport and within the territory. Book a taxi at My Taxi India and experience the difference!